In 1914, the Ottoman Empire had existed for 600 years. It stretched from the Black Sea in the north, to the Yemen in the south. From east to west it covered land from the Persian frontier to the Greek frontier and below this, from the Persian Gulf to the Red Sea. It was a relatively cruel and repressive empire as the Turks subjected any peoples or organisations showing dissension to their rule to severe punishment. At the centre of this empire, lay the Hejaz, a Turkish Arab Province containing the Islamic Holy cities of Mecca and Medina. The Hejaz ran from the southern border of Palestine, down two-thirds the length of the eastern coast of the Red Sea, an area of barren land consisting of a five miles deep littoral of scrub inland from the coast, backed by a range of stark mountains seven to eight thousand feet high. Beyond these mountains lay the burning and featureless 'Empty Quarter' of the Arabian Desert. As there were no proper roads, the Ottomans had extended the railway line, running it from Damascus through Palestine and the Hejaz to Medina, 820 miles in all. Ostensibly it was to carry pilgrims to the Holy Cities, but it was also intended to supply and support the Ottoman garrisons spread throughout this part of their empire. Arab dissension from Turkish rule originated in Syria and had spread widely, being taken up enthusiastically by the Arab Revolt in the Hejaz, with the intent of creating an independent Arab Nation. We are seeing this again today with Palestinians and the troubles in Israel, Gaza and the West Bank. Who were the main players with whom we are directly concerned in this World War One drama? Titles and ranks are given as they were at the time. 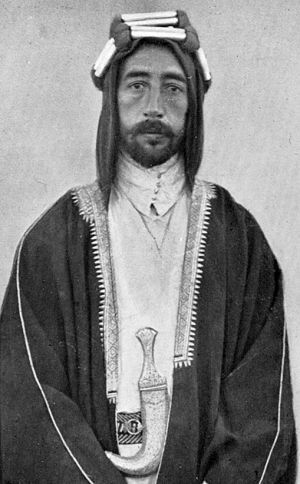 HUSSEIN– Grand Sharif of Mecca of the Hashemite Family, leader of the Arab Revolt in the Hejaz. Freed Mecca, Ta'if, Jeddah and Yenbo from the Turks. ALI– Emir, eldest son of Hussein, leader of the Arab Southern Army of 8000. Laid siege to Medina and its Turkish garrison of 14000 which did not surrender until 1919. ABDULLAH– Emir, second son of Hussein, leader of the Arab Eastern Army of 4000. FEISAL– Emir, third son of Hussein, leader of the Arab Northern Army of 9000. His force consisted of volunteer Arab tribal Irregulars along with many Turkish prisoners-of-war and deserters. Emir Feisal - Lawrence wrote of him: 'He looked very tall and pillar-like, very slender, in his long white silk robes and his brown headcloth bound with brilliant scarlet and gold cord'. Capt T.E. 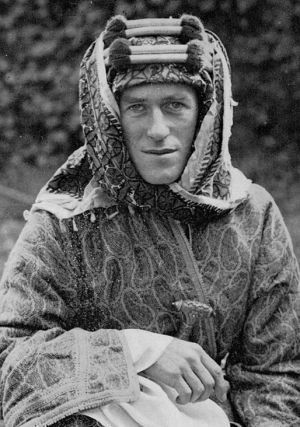 Lawrence - He sometimes wore full robes but more often, his Regulation Arab Army tunic with leather 'football' buttons and a headcloth.